06 September 2011, 13:01 p.m.
A Transactional Relationship, is relatively simple, often easy to replace (if it stalls) and the conversation is based on unit costs and delivery, with the talk based around standard offers, rate cards, scopes and specifications. A Managed Relationship – requires a boutique service, a tailored offer, specialist reporting or pricing. It is complex – but at its heart, it is still a vendor-purchaser transaction with the invoicing going one way. A Partnership – requires both parties to have a shared understanding, to collaborate and build a joint plan, understanding what value the other party is seeking. It may involve cash. It may not – as cash is not the only currency. It will more than likely require both parties to change what they do as ‘business as usual’. A partnership requires more communication, more conversation time – and its movement forward is oiled by a lot of trust. How do you know when you need to treat a relationship as a partner? The simple test is that if its difficult, expensive if not impossible to replace – then you’d be a fool not to treat such a high value relationship as a partnership. You need to nurture it; be it a critical supplier, a valuable customer or a hard to get content provider. 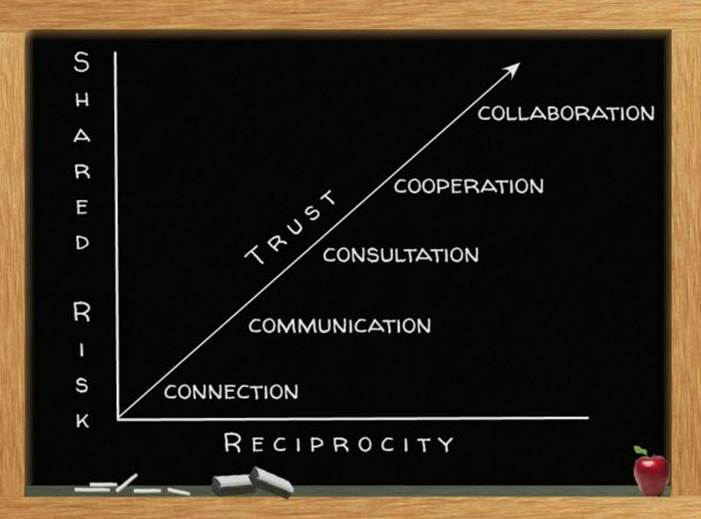 On this point, Jamie Billingham also recently published an interesting graphic explaining how an increase in TRUST (that mysterious and highly valuable element of business relationships) – takes a connection to become a collaboration, through an increase in shared risk and reciprocity. It’s a smart and simple way to think about it. 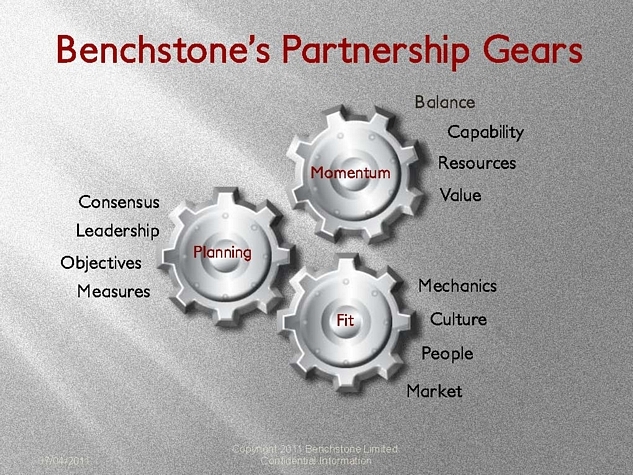 At Benchstone, we often discuss how the three key Partnership Gears – Fit, Planning and Momentum – are ‘oiled’ by Trust, created with a high level of communication and getting the simple ‘little steps’ in place. Without an ability to build trust, the relationship either stalls, goes backwards and ultimately fails. Or – it can be retrieved and revert to a transactional relationship. In many cases, a transactional and highly functional relationship is all that is required. For the full piece by Seth Godin see – Talent and vendors. And to see the work of Jamie Billingham - click here.